Talks between Zimbabwe's ruling Zanu-PF party and both factions of the opposition Movement for Democratic Change are under way in South Africa. This is their first meeting since June's run-off poll, which President Robert Mugabe won unopposed after the MDC pulled out because of violence. South Africa President Thabo Mbeki is leading mediation efforts. But MDC leader Morgan Tsvangirai has issued a statement saying the talks do not amount to formal negotiations. It is a first step, correspondents say, but Mr Tsvangirai insisted that MDC representatives were merely setting out the conditions under which talks could take place. He added that nothing could happen while Mr Mugabe's ruling Zanu-PF party "continued state-sanctioned violence and repressive legislation", which he said was "designed to silence the Zimbabwean people". Mr Tsvangirai also demanded the release of more than 1,500 political prisoners and an expanded mediation team that included a permanent African Union (AU) envoy. Both the government and opposition in Zimbabwe are under pressure from the AU to start a process of dialogue on forming a government of national unity. Last week, Mr Mugabe accepted the need for negotiations but demanded that he must first be recognised as president by the opposition. The BBC's Peter Greste in Johannesburg says the fundamental gaps between the two sides remain as wide as ever, so the talks appear driven more by international pressure than any willingness to compromise. While Zimbabwe's deputy information minister, Bright Matonga, has brushed off talk of UN sanctions as irrelevant, our correspondent says, there is considerable pressure from influential African presidents like Liberia's Ellen Johnson-Sirleaf. But Mr Mugabe has a long history of shrugging off such pressure and maintaining his grip on power, our correspondent adds, and there is no evidence he is ready to change. Meanwhile, the US and the UK are pushing for a travel ban and assets freeze on President Mugabe and 13 of his allies, and an arms embargo. Ahead of an expected UN Security Council resolution, the European Parliament has called on European countries to impose more economic sanctions against members of Zimbabwe's government. The parliament in Strasbourg said travel restrictions on businessmen who financed Mr Mugabe's government should be among the new measures. It also said the banks that provided loans or invested in Zimbabwe should be exposed. The vote is non-binding. The UN Security Council is due to meet in New York to discuss a draft resolution on Zimbabwe, despite several African leaders saying they oppose sanctions, including South Africa. Mr Mbeki reportedly told G8 leaders earlier this week that UN sanctions could lead to civil war. South Africa is currently on the UN Security Council but does not have the power of veto. South Africa's leader tried to meet all sides in Zimbabwe over the weekend. 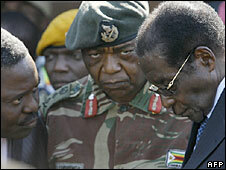 But Mr Tsvangirai refused, saying meeting Mr Mugabe at State House would mean recognising his legitimacy as president. Mr Tsvangirai won the first round of Zimbabwe's presidential elections on 29 March, but official results gave him less than the 50% share needed to avoid a run-off. Since March, the opposition says more than 100 of its supporters have been killed, some 5,000 are missing and more than 200,000 have been forced from their homes. A special one-hour programme of BBC Focus on Africaexploring the political, economic and social prospects for Zimbabwe will be broadcast on Tuesday 15 July at 1500 GMT on the BBC World Service.